Share this product and receive a $4.37 sharing discount. '...like a tree planted by streams of water... whatever he does prospers. 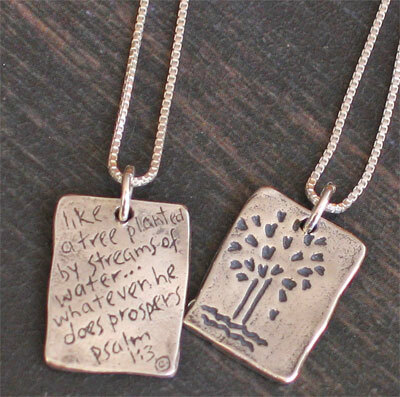 Psalm 1:3"
This silver handcast pendant will make your faith visible! The front of the pendant shows a tree planted by water. The backside has the handcasted scripture. Overall the pendant has a handcast feel to it as it is irregular with grooves and divets... quite popular in today's fashion! 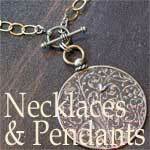 The pendant measures 3/4" long by 1/4" wide. It has been strung on a 18" sterling silver chain.